Plus the new A16 in Rockridge and ice cream drama in Berkeley. When Guest Chef (5337 College Ave., Oakland) opened a year and a half ago, there was nothing else quite like it: a brick-and-mortar restaurant with no permanent chef and no fixed concept — a place where change was the only constant, and where the whole enterprise reinvented itself every two weeks. The restaurant, the brainchild of real estate developer Scott Cameron, pioneered an innovative business model whereby chefs of all different levels of experience could try their hand at running their own restaurant for a two-week stint — all without assuming any greater financial risk than the cost of groceries. It was a bold idea, and one that was refreshingly democratic. So when Guest Chef had its last day of service last week, it left fans of the restaurant — and of alternative business models in general — wondering what went wrong. Had the dining public finally tired of the whole pop-up trend? Had customers grown disillusioned with an arrangement that was, by its very nature, hit or miss? After all, it only took one subpar experience with a "guest chef" to discourage return visits. Cameron said the truth was much simpler: Chefs simply stopped applying. And so Cameron went from having three or four high-quality applicants to choose from for each two-week pop-up stint to only getting a couple of applications every month, and many of those from chefs with more "marginal concepts" — or, at the very least, concepts that didn't have a big built-in customer base. When one chef cancelled recently, with no backup in the queue, Cameron ended up having to shut the restaurant down for two weeks. Guest Chef made its money by taking a percentage of the chef's total sales rather than by charging a fixed rental fee. And so if a particular chef had a faulty concept (or mediocre food, or a lack of social media savvy), the entire business would suffer: "If the chefs didn't do well, we didn't do well. It was a shared risk." Cameron said he wasn't sure why chef applications suddenly stopped coming in, but he had a guess: "My one theory is that the economy has gotten better, and people have gotten real jobs" — the kind of jobs that make it difficult to take two weeks off to open a restaurant. It certainly wasn't for lack of media buzz. For a while, the restaurant was the darling of food bloggers and trend-watchers. The Wall Street Journal ran a story. What the Fork has covered the restaurant on several occasions. Any way you cut it, there's nothing easy about running a business that requires you to, essentially, build up a brand new restaurant from scratch every two weeks. Cameron said the chefs he met with were always confident that they'd pack the house every night — but, especially in cases when they were home cooks or up-and-coming chefs without an established following, those crowds just didn't always materialize. Still, Cameron said that chefs ended up having nothing but praise for the Guest Chef experience, and several who went on to pursue full-time culinary careers later emailed him to say, "It literally changed my life." Cameron, for his part, has fond memories of people from the neighborhood who would come for every single pop-up — irrespective of concept or cuisine — and of the passionate chefs. And he still believes the Guest Chef model can work, though he said that if he were to do it over again he would make sure he first established a pipeline of good chefs, perhaps through a local culinary school. "That was where the stress really came from. I was like a shark constantly looking for chefs, and you have to keep swimming," he said. Cameron's next project is as manager of Commissar, the restaurant component of the ambitious multi-use complex that Rasputin Music founder Ken Sarachan has planned for the old Cody's Books space (2454 Telegraph Ave., Berkeley). Sarachan's description of the food concept — mostly vegetarian peasant food "that would suit a discriminating Soviet official's culinary tastes" — is nothing if not curiosity-piquing. But for now, Cameron is keeping his cards close to his vest. He said he'd like there to be some "Guest Chef"-style component to the restaurant. But exactly what form that will take is still under discussion. 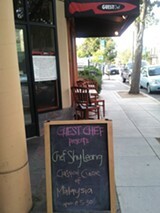 In the meantime, diners can visit Guest Chef for a couple of last hurrahs while the restaurant is on the market. The first of two series of "Back from the Dead" dinners will run from June 4 to 16, and will be a $35 prix-fixe cooked by Jackie Kirschner and Michael Wilson, aka the Culinary Addicts. The second, July 5-7 and 12-14, will feature a northern Italian menu cooked by Adam Zappa. The new Rockridge outpost of the San Francisco's A16 restaurant will open Thursday, May 30, at 5356 College Ave., in the former Hudson space. The seafood-intensive menu, from chef Rocky Maselli, will focus on Italy's Puglia region. As with the original San Francisco A16, there will be Neapolitan-style pizza from a wood-burning oven. ... Berkeleyside Nosh reports that the owners of Berkeley's C.R.E.A.M. (2399 Telegraph Ave.) have asked the city to revoke the permit for the (very similar-sounding) Dream Ice Cream takeout window, which Rasputin Music owner Sarachan wants to open across the street at his music store. The city council will revisit the issue later this year.